Facts about Norwegian Buhund Dog, "Scientific name for Norwegian Buhund Dog, or domestic canine, is Canis lupus familiaris". The Norwegian Buhund Dog is a variety of dog that hails from Norway and belongs to the Spitz category. The Norwegian Buhund Dog breed is closely associated with the Sheepdog of Iceland. The Norwegian Buhund Dog is a multipurpose animal that can be used for farm and herding purposes, including for watching purpose. The Norwegian Buhund Dog breed is called by another name, such as Norsk Buhund Dog. A Norwegian Buhund Dogs can hear a sound at four times the distance of a human. Sound frequency is measured in Hertz (Hz) Def-Hertz is the measurement of frequency, explicitly it's one cycle per second. The higher the Hertz are, the higher the pitched the sound is. Norwegian Buhund Dogs hear best at 45,000 Hz to 65,000 Hz, while humans hear best at around 20 Hz to 20,000 Hz. The Norwegian Buhund Dog breed is a Spitz category dog of average body size. The muzzle and the skull of this dog breed are of equal length, with a well-defined stop. The Norwegian Buhund Dog have a black colored nose, and their eyes are oval in shape, which are dark in color, with black colored eye rims. The prick, average sized ears of the breed are vertical and are extremely mobile. The tightly coiled tail of the Norwegian Buhund Dog is over the back. The fur of the dog is biscuit or wheaten in color, varying from light to black, yellowish red, and wolf-sable. 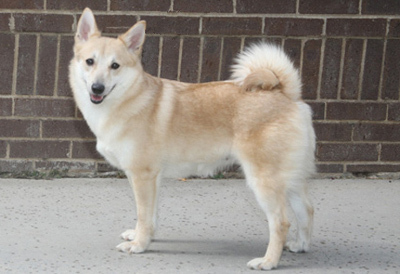 The external coat of the Norwegian Buhund Dog is harsh and smooth, whereas the undercoat is flexible and wooly. The feet of the Norwegian Buhund breed are tiny, oval in shape and webbed. Norwegian Buhund Dogs sweat glands are between their paw pads. The Norwegian Buhund Dog breed is watchful, jovial, active, tireless, clever and helpful. They are extremely affectionate, and they love, offering snuggling and kisses. The Norwegian Buhund Dog breed requires mental and physical stimulation, and needs reliable, solid leadership because the dog can be headstrong if it detects its handlers are not as determined as itself. The Norwegian Buhund Dog breed is a natural watchdog, which is courageous and vocal, but not violent. The Norwegian Buhund Dog breed has an average to short trouble-free-care, hair that does not tangle or mat while it sheds. The coat is supposed to be brushed frequently and requires additional care during the shedding season. The Norwegian Buhund Dog breed is a cyclic heavy shedder. The average lifespan of the Norwegian Buhund breed Dog ranges from 13 years to 15 years. If purchasing a Norwegian Buhund Dog from a breeder, make sure to find a good breeder with references check at least two to three of the puppies that were purchased from this breeder. The Norwegian Buhund Dog in 2009 was recognized by the (AKC) American Kennel Club. Only humans and dogs have prostates, But a dog doesn't have an appendix. Norwegian Buhund Dogs have two times the amount of ear muscles than people. Norwegian Buhund Dog’s nose prints can be used to identify them, their nose prints are like a humans finger print. A Norwegian Buhund Dog smells more than 1,000 times stronger than that of a human. A Norwegian Buhund Dog’s nose, secretes a thin layer of mucous that helps it absorb scent, after that they lick their noses and sample the scent through their mouth. A Norwegian Buhund Dog’s mouth can apply approximately 150 to 200 pounds of pressure per square inch and an American Pit Bull Terrier, German Shepherd Dog and a rottweiler can have 320 LBS of pressure on avg. A Norwegian Buhund Dog is an omnivore, (definition-they eat both other animals and plants). All Dogs are direct descendants of wolves. The number one heath problems amongst Norwegian Buhund Dogs is obesity, so always make sure your dog doesn't get to fat. Many foot problems that Norwegian Buhund Dogs have are just an issue of long toenails. Norwegian Buhund Dogs pant to keep cool with 10 to 35 breaths per minute with an average of 24 breaths per minute. A large Dog breed resting heart beats between 60 to 100 times per minute, and a small dog breed’s heart beats on average between 100 to 140 pant a lot. The fear of a dog Cynophobia.